Finished block size: 30 x 30 cm 12" x 12"), plus seam allowances. 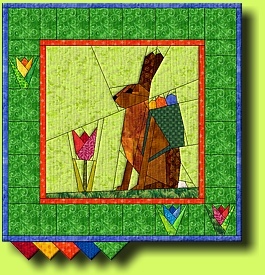 Quilt size ∼ 48 x 48 cm (∼ 19" x 19"), border tulips are included. As the name indicates this pattern was originally published as a mystery. Therefore the sections are marked differently than usual and assembling is a bit tricky. Sewn projects are in the Guest Gallery and my personal friend resides here. If you want to purchase the pattern email me. Patterns are intended exclusively for your own personal use.